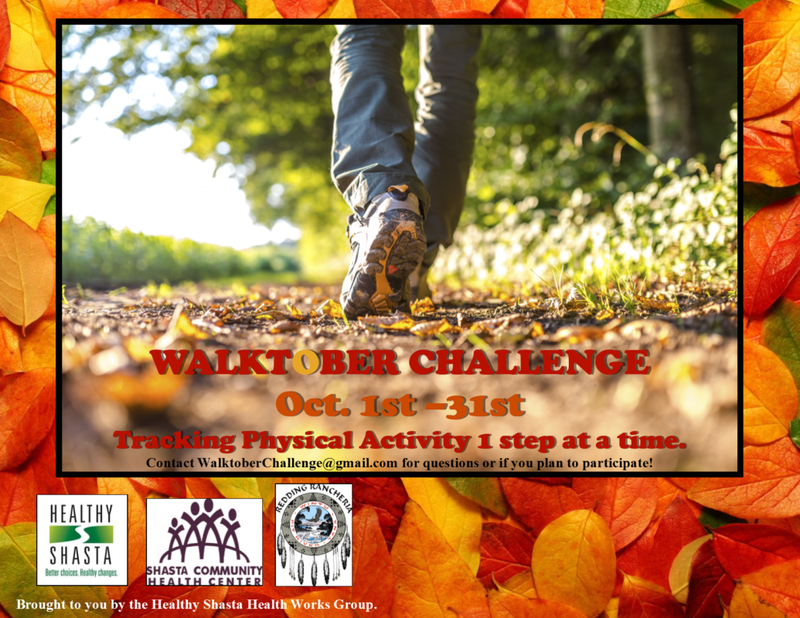 Healthy Shasta’s Health Works group is excited to invite you to participate in this year’s Walktober Challenge – friendly, inter-agency worksite wellness challenge. The challenge runs the entire month of October. Track steps, similar to a pedometer challenge except you can convert your physical activity (bicycling, kayaking, etc.) into steps using our activity convertor. Join Redding Rancheria, Shasta Community Health Center, Shasta County HHSA Public Health, and others in our mission to provide employees with opportunities to engage in more physical activity with this fun and easy competition! We welcome all workplaces and encourage anyone to join. Will there be prizes for participating? Yes, you can count on prizes again this year. All individuals who participate will be entered into a drawing were winners will be randomly selected (prize info coming soon). For more information and tools, visit our Walktober Challenge page. For questions, contact WalktoberChallenge@gmail.com or (530) 229-8456. Don’t see your workplace? Let us know!